Jay Singletary lives with ghosts. 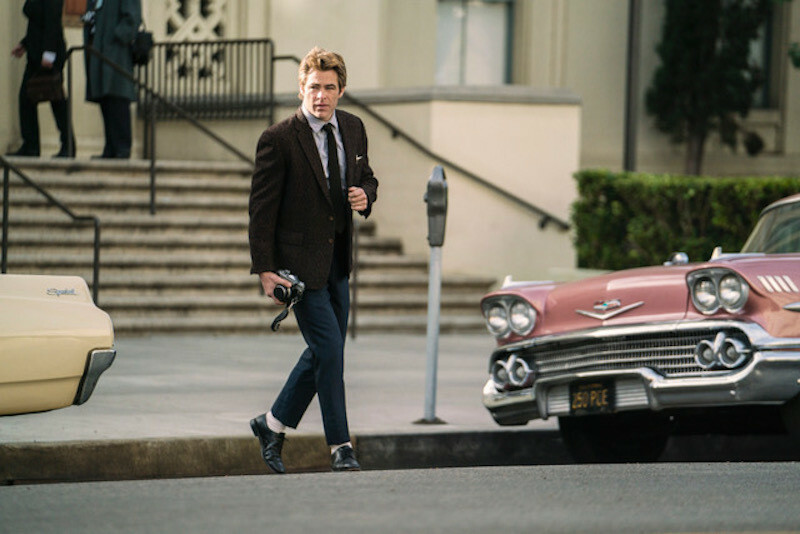 We catch glimpses of them here and there throughout “I Am The Night”, the Chris Pine-starring limited series from Sam Sheridan (the series writer) and Patty Jenkins (a producer, who also directed three of six episodes). The reporter, a veteran of the Korean war, sees men who aren’t there, everywhere. Sometimes they’re frozen. Sometimes they stare. But whether their eyes remain locked on him or not, whether he studiously avoids or returns that gaze, their presence is a weight on him. His eyes go a bit vacant. He’s somewhere else. It’s a perfect marriage of image and performance, an example of “I Am The Night” at its best. How it functions within the story, why it is returned to again and again, what it says about Singletary’s connection to the crime or his co-protagonist—all remain open questions. In that respect, it’s “I Am The Night,” a frustrating and disappointing affair, at its worst, too. Who is the night? Six episodes later, this writer has no idea. That’s pretty typical of “I Am The Night,” as well. Ostensibly the story of Pat (India Eisley), a teenager who discovers her mother Jimmie Lee (Golden Brooks, terrific) has been lying to her about her background and that her name is actually Fauna Hodel, the series follows Fauna/Pat away from her Nevada town and into Los Angeles, where she seeks her biological grandfather, the famous doctor George Hodel (Jefferson Mays, bizarrely underused). The idea of tracing a young woman’s quest to untangle the mysteries of her own heritage, and using that quest as a means to enter—as if by accident—one of the most famous true crime stories in American history, is an interesting one. Imagine tugging on the threads of your own biography and a boogeyman falls out. But once the name Hodel actually enters the story, Fauna becomes an audience avatar, rather than a character experiencing something of which few people could even conceive. Her story’s been swallowed alive by a genre, and by the actor anchoring that portion of the story. That’s absolutely not a crack at Chris Pine, who lends the Singletary portion of the story the depth and nuance that keep “I Am The Night” from becoming an unbearable slog. (The same is true, though to a lesser extent, of some of the performances in last year’s “The Alienist,” another gory TNT crime adaptation that relied on style and movie stars rather than substance.) While Fauna Hodel was a real person, and the events of the series based in part on her autobiography, Singletary is an invention, and a walking staple of the crime genre: the hard-bitten but secretly good-hearted detective/reporter whose career was derailed by the Case That Got Away. Singletary’s big fish was George Hodel, Fauna’s grandfather, who oh, by the way, was suspected of several murders and other nefarious dealings, and whose teenage daughter Tamar accused him of sexual assault. In this fictional exploration of the story, Singletary’s reporting on the Hodel trial turned him from hotshot journalist to flailing addict and paparazzi, and a mysterious phone call telling him to go back to chasing the story sends him back down the rabbit hole. He’s the only one who wants Hodel brought to justice; he seems to be the only one who finds him suspicious. All others either refuse to believe the possibility of Hodel’s guilt, or are bought and paid for. One man against the world, and that man is not in great shape. It’s not great storytelling. That Singletary’s inner life ever feels within reach is a credit to Pine and to the series’ directors (Jenkins, Victoria Mahoney, and Carl Jenkins), who give the actor plenty of space to fill in the considerable gaps in his character’s arc. Any time Singletary feels illuminated, it’s because Pine took a long beat to catch his breath, or allowed us to watch his pulse shoot upward; the self-recrimination, disgust, despair, certainty, and above all, the need parade across his features in quiet moments. “I Am The Night” is far more interested in displaying the mess than exploring it, content to give its arguably central figure a tortured past and call it a day without exploring how his death-related trauma might relate to his compulsion to catch a brutal serial killer at any cost. But if “I Am The Night” is disappointingly uninterested in the inner workings of Singletary, then it flatly refuses to acknowledge that Fauna might have any. Eisley doesn’t fare as well as Pine, a fact that can be attributed in part to the writing. The series is content to turn Fauna into a would-be Nancy Drew, unraveling the mystery because she “has to know” (a justification she repeats quite often, without it every sounding all that convincing); it never investigates why she has to know, or how it feels to do this exploring and to do it alone. It doesn’t ask questions about Fauna’s abusive relationship with her adopted mother, who loves and wounds her with great frequency, or her feelings about the revelation that her birth family come from loads of money. But neither of those complaints holds a candle to this one: Fauna, having been told her whole life that she’s biracial, must confront the possibility that she’s not. It’s not that “I Am The Night” ignores this storyline. But it treats the possibility like a particularly gasp-worthy twist, rather than a question that would force a young woman to open up a very complicated door in her life. That’s a lot to unpack, but “I Am The Night” doesn’t get far beyond “racism is bad,” and gives Eisley little to play beyond shock and sorrow. That is, until it gives her a lengthy speech about art and authenticity—a good speech, but one that underlines exactly the deficiencies of the series in which it appears. Perhaps it’s fitting that the most defining characteristic of this limited series is the pile of questions left unexplored. That’s Singletary’s reality; it’s also the space in which Jimmie Lee lives. But more than any of its characters, more than the belligerent LAPD or the willfully ignorant people in Hodel’s orbit, it’s “I Am The Night” that really stops shy of asking the big questions. That there’s any sense of danger or intrigue at all speaks well of the directors, cinematographers, and composer David Lang; that there’s any emotional heft can be largely credited to Pine, pushing a bloody boulder up a neon-lit hill. But in the end, it’s all as empty as the hollow paintings of a soulless man. Watch it on mute, and listen to a podcast.